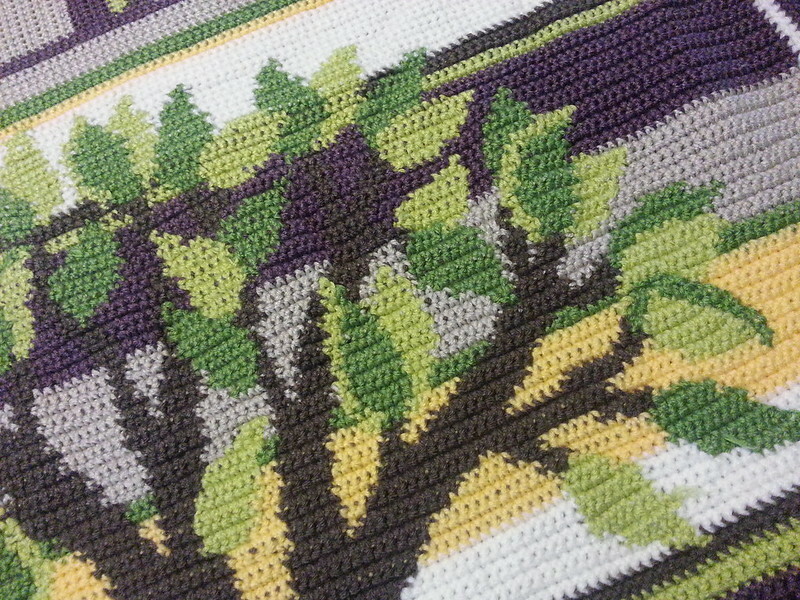 If you’ve seen me for any length of time in the past year or two, particularly if it was a situation which involved sitting, chances are you’ve seen me working on it, either plotting and scheming with a notebook full of squares and trees, or actually crocheting the little beastie. Each unit would be a single crochet stitch, so I’d start with a 1 (which was actually a tiny little square of 4 single crochets around, so I’d have something with a little substance, but still a side with 1 stitch to start with. Into one side of that, I’d make another little square of side length 1. I’d turn it, and on what was the side of the stack, crochet into those two stitches to start a square with side length 2. Turn it 90 degrees counterclockwise, and I’d have 3 stitches on which to crochet a square of 3 rows of 3. Turn, 13 square. Turn, 21. Turn, 34. 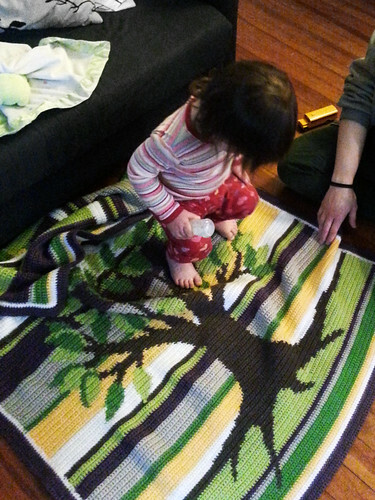 And so on, working outward from the center, following the Fibonacci sequence until the blanket was big enough! Rachel already knew what crib set she was getting, and it was clear why – freakin awesome hippos. 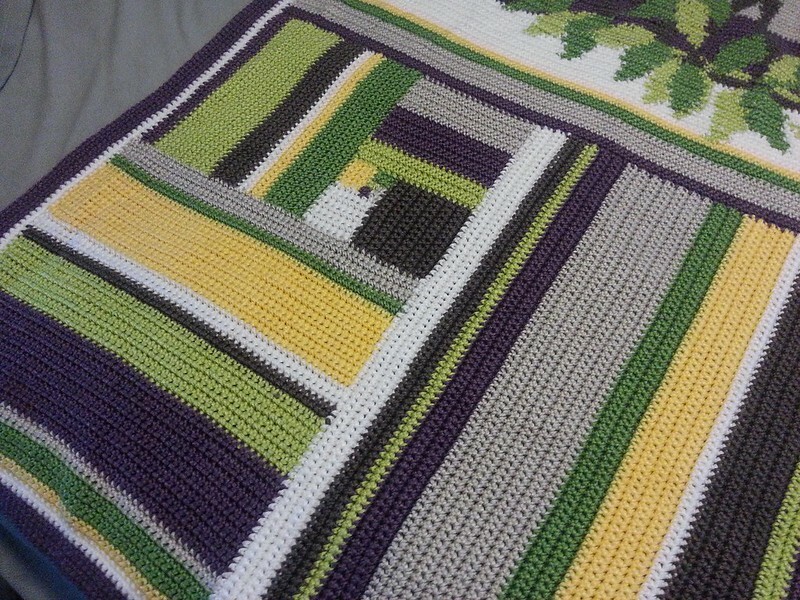 So I found the yarn to match – the two shades of green, soft brown, buttery yellow, pale sort of sand/stone color, white, and I threw in a nice dusty purple to add a little slightly-more-girly twist… and off I went! 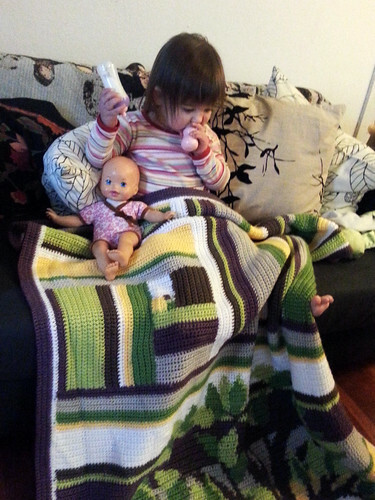 The crocheting up to that point went pretty quickly, comparatively. I mean, it was a large area all in tiny single crochet, but except for the first row of each square (which took a bit of concentration since I was working into the side of previous rows) and remembering to change colors every so-many rows, it was all just long rows of single crochet – requiring abosolutely no concentration. So I’d just tote it around to work on while listening in church, chatting with a friend, watching tv, sitting in a cafe, whatever. And thus, good progress was made. 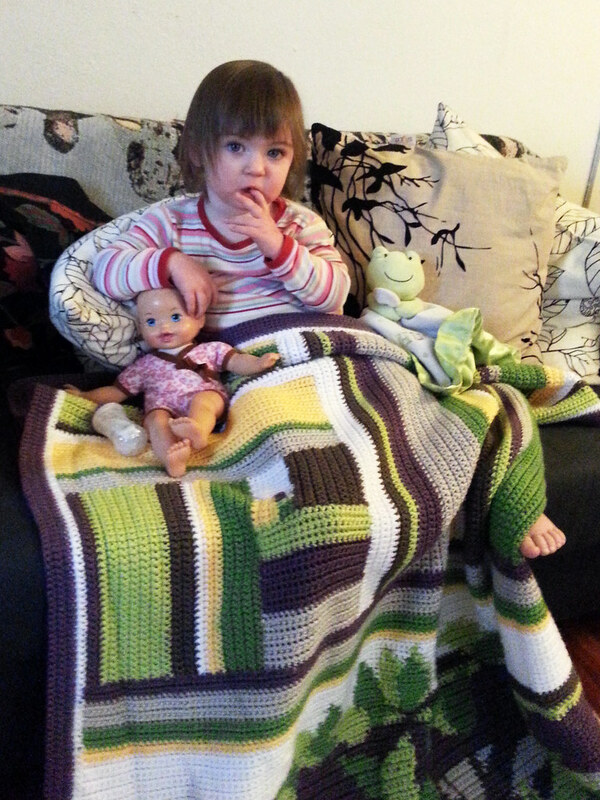 When I’d finished crocheting that chart – up through the 89 square, it’s long side was a pretty good width for a little kid’s blanket, so adding one more square (144) would make the blanket big enough, give or take a border around the whole thing, maybe. 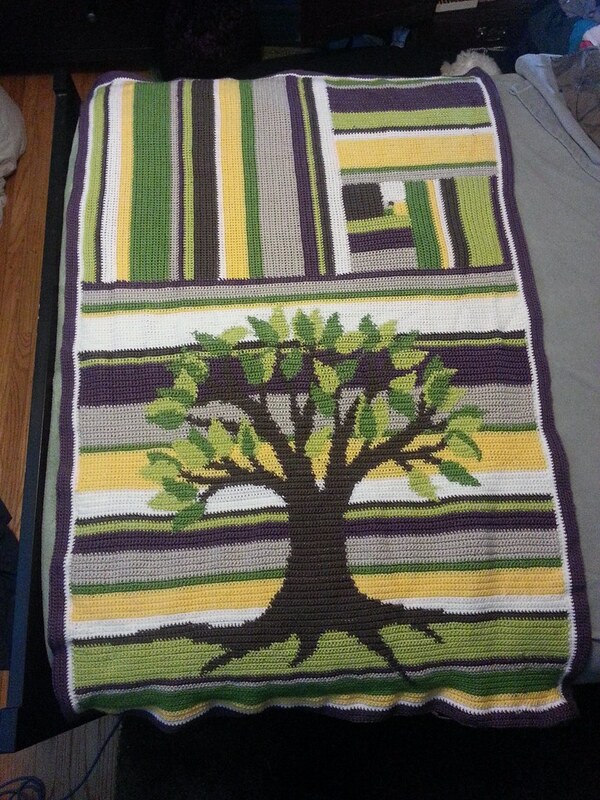 So I decided to put a tree in it! Frankly, at that point, I was pretty darn proud of myself! 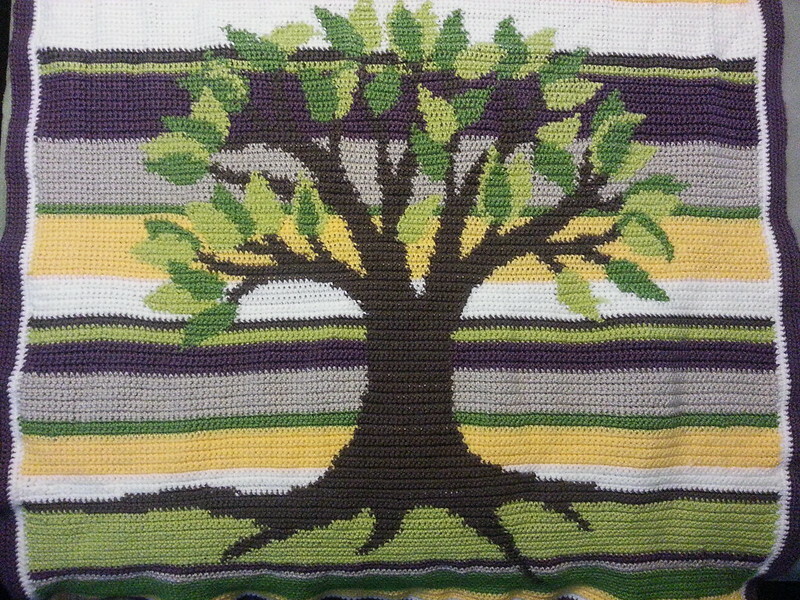 …Until I got a few rows into crocheting the leaves (working top down, since I obviously wanted the tree upright, and decided the smaller squares should be the top of the blanket). I still just kept toting it around everywhere I went, but now also had to tote a giant, taped-together, blown-up printout of the chart, and mark each tiny little square so I knew what came next! It was a little absurd, but by this point its intended recipient was almost a year old, completely adorable and funny and sweet and smart and absolutely worth it. So I didn’t mind at all. 🙂 And then I finished it! Wove in a thousand little yarn ends, added a border, gave it a good wash so it’d be nice and soft, and gave it to lovely Gwenny! Its funny, the design is actually more fitting than I realized (until it was very nearly done. Gwenny’s full name is Gwendolyn Shiloh which means “beautiful peace” – and so does this blanket, in a quirky, nerdy sort of way! To me, and I’m sure I’m not alone, trees represent both stability and growth. They’re sturdy and strong, full of life, and calming. They represent peace. They’re also beautiful. But part of what makes them beautiful, visually, along with so much of nature, is – oddly enough – directly related to the Fibonacci sequence and that arrangement of squares! This boggles my mind with its awesomeness. I mean awesome in the literal sense of the word. It inspires some awe. I would say awefullness, because I really feel full of awe, but that would confuse everyone.